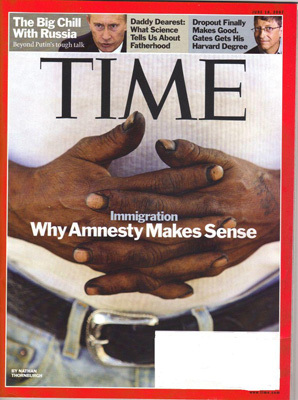 Where is the money behind illegal aliens in America? This is an example research problem, because you have direct hiring of illegal aliens by Zirkle Fruit, but the products they sell may be distributed under different labels, i.e., Rainier Fruit. Thunk it up . . but credit where it's due, I heard the term "voting brown" from the Hispanic community, i.e., Reverend Luis Cortes. I thought "The Brown List" was an enumeration of UPS Locations. I "used to" buy insurance through Allstate. I "used to" buy lunch at McDonald's. I "used to" buy products from Betty Crocker, i.e., Jolly Green Giant. I "used to" buy products from Coke. I "used to" buy products from Pepsi. I "used to" ship via UPS. Not as easy as it sounds, i.e., Pepsico is also Frito Lay (Lays), Tropicana, Quaker Oats, Gatorade . . all stuff I "used to" buy. First, you have to identify it. First of all, you have to identify it. To me this is interesting, boycotts can be a strong show of belief. However, there are a ton of huge American companies on that list. I tend to think boycotters may not have any idea which part of that Chicken Sandwich you just bought from some name not on the list, that was created by someone on that list. How difficult would it be for the common American in suburban sprawl to avoid buying something from someone on that list? For example companies like: Citi, Pepsi, Coke-Cola, Northrop Grumman, Chevron are cogs in the engine that drives America. It would be very difficult to know what is being produced by them that you are purchasing directly or indirectly. Example, here's an easy one to identify. I agree, it's not always easy to identify . . this is a subsidiary company, so even if I "used to" buy Time Magazine, it's not the source.